We hear it all the time in the media or from friends that we can expect to be sick due to winter’s imminent arrival. While it is true that winter temperatures bring us less sunshine (vitamin D), less exercise and fresh air (oh how we long for those long family walks and park time come February), and harder access to quality produce (organic prices can skyrocket or be really hard to find at all). 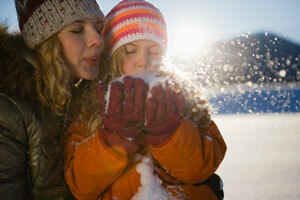 We’ve put together some tips for being proactive on beating those winter blues or even better…not having them at all! People do not get sick more often in the winter because there are more germs and bugs floating around, they get sick more often because they are LESS healthy and strong than they are during the summer. You just have to work a little harder to stay healthy during the winter. We do not get sick from simply being exposed to germs, we get sick when we are too weak to fight them off. Since the human body is rather incredible, it has the ability to transform sunlight and turn it into energy and Vitamin D production when exposed. However, we live in Chicagoland, and the next time our skin will be exposed to the sun is about 5 months from now! So, we will produce little Vitamin D on our own throughout the winter, and while some foods are now fortified with it, it is simply not enough. Vitamin D is crucial for immune support, and will go a long ways to fighting off winter time colds, flu and respiratory troubles… plus so much more! About 80% of the population is estimated to be deficient in Vitamin D, and in the winter the only way to address that is with proper supplementation. You can get the highest quality Vitamin D supplements for you and your children right from our office. Be wary buying vitamin D from any retailer as the quality of the product is directly related to the quality of the absorption. Most Americans do not get sufficient amounts of exercise and that gets worse in the winter when we barely venture outside. However, nothing has been proven to be as immune-boosting and mood-boosting as GETTING MOVING! Go to www.crossfit.com for more info, and check out our local affiliates www.crossfitamrap.com (or www.crossfitprevail.com if you are a McHenry resident). I know, I know… you’ve heard this one a million times and you just can’t seem to do it! Well, stop making excuses and start making it a reality. Since farmer’s markets are over, you’ll have to rely on our local grocery stores which sometimes means quite a few stops to try and find fresh and organic produce. If your family loves a certain type of produce and you can’t seem to find it anywhere organic just be sure to get some fruit and veggie wash to take off some of the pesticide residue left behind. Regular chiropractic care has been shown to boost immunity, improve DNA repair, improve mood, and so much more! Not only that, but by getting all those benefits and staying healthy through wellness-based adjustments you save tons of $$$!!! Getting sick in the United States of America is very costly! We have the most expensive healthcare system in the world and that does not include the additional costs of time off work if you can’t go in or you need to stay home with your child, and all the lost productivity there. This point was well illustrated by a recent study of 70,000 Chicagoland patients compared to patients under the care of a Medical Doctor, those under the care of a Doctor of Chiropractic demonstrated decreases of 60.2% in-hospital admissions, 59.0% hospital days, 62.0% outpatient surgeries and procedures, and 83% pharmaceutical costs. Bottom line, getting sick is not fun, and it is expensive! Stay healthy and proactive with these 5 simple steps this winter, and you’ll be flying into 2017!! !